One of the biggest considerations for women when they find out that they are pregnant is how their work will fit in with their pregnancy and their new arrival. Although many people choose not to announce their pregnancy until the first few months have passed, it generally makes sense to let your employer know pretty early on, so that they have an understanding of any sick days you take, they can allow for your antenatal visits and provide changes to your work environment or practices as necessary, as well as preparing for your absence during maternity leave. Standing on your feet all day at work is tiring at the best of times, but during pregnancy it can lead to swollen ankles and poor circulation and you could run into some health problems. If you do any lifting, reaching or bending at work you should reassess the weights you can carry and what movements might cause undue strain on your body. Pregnancy hormones relax your joints, muscles and ligaments, so sprains and strains are more of a problem. If you wear a uniform, you may have to be excluded as you grow into maternity clothes, most employers are willing to compromise if you wear something in the same colour as everyone else. With good communication, most employers are willing to make the changes necessary to help you to continue to be as productive as possible during your pregnancy. When you become pregnant there will be many worries on your mind and many things that you will have to prepare for. Preparing your wardrobe for pregnancy and for the stages afterwards is one of those things and can be an exciting and enjoyable aspect of this period. There are many fashions now available for the pregnant woman and it is absolutely possible to continue your stylish look. Read on to see what we consider what you will need in your wardrobe during pregnancy. 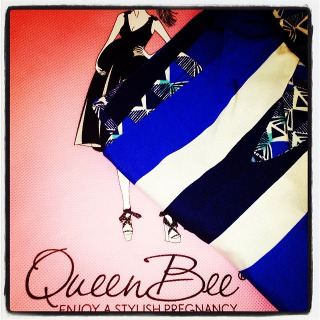 Which Aussie celebrity loves her pregnancy style from Queen Bee?